We're back to a completely full schedule again with the first English corner since I arrived back from Japan. Work is still a little crazy with too many projects on the boil but I did get a chance to escape from the office for a bit this weekend. It's a pleasure when the rather anonymous words on the screen turn into a real person and I finally met up with Kevin of Weifang Radish fame and his wife Jinjin of Weifang Radish fame, by proxy. A very enjoyable evening chatting with someone who has spent a good length of time in various parts of China and who's blog continues to be an interesting read. Lots of hints for places to try and visit in my remaining time here, too, though I fear spare time may not be in great supply. There's been talk in the local papers of the rather infamous Sensations art show coming to Beijing's Capital Art Museum. Unfortunately, having read the papers I completely forgot which gallery it was to be shown at and ended up at a rather insipid exhibition at Beijing's World Art Museum of photographs of 'new Beijing' which was very uninspiring. They're currently also showing a display of Egyptian artwork with some fine sculpture but anyone who has been to the British Museum or the like is probably going to be rather unimpressed. 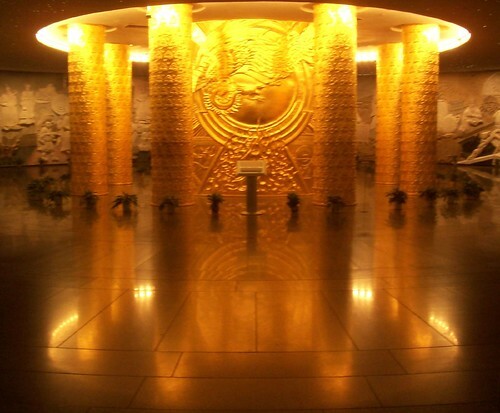 In the basement is a carved mural of Chinese history which is worth a peak and the central golden columns are wonderfully gaudy, if nothing else. On the way to the train station I passed a young girl sitting idly in a chair overlooking the remains of the flats which had once sat where she now was. I found it rather more moving than any of the art on display at the museum.